– With plenty of equipment for a trip to the mountains (incl. climbing harness, climbing helmet, backpacks, walking sticks and more). - The included safety rope can be hung on the five hooks attached to the rock. - PLAYMOBIL figures can abseil down the rock with the climbing harness and rope. - The rock can also be climbed with the included climbing tool. - PLAYMOBIL figures can also freestyle climb at the front tunnel entrance. - Incl. various mountain animals. Price is 33% below the initial Playmobil retail price, a € 20.00 discount! 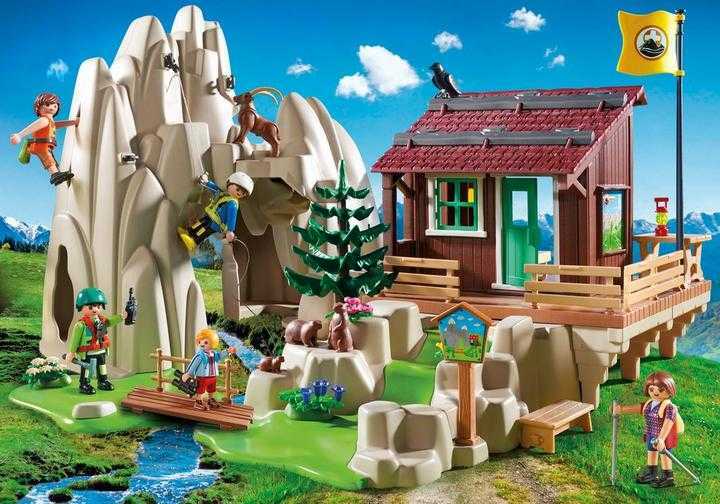 The Rock Climbers with Cabin (9126) Playmobil set is available from the sites below. However, they do not offer delivery to your selected region. The Rock Climbers with Cabin (9126) Playmobil set is no longer directly available from the sites below. However, 3rd party partners of these sites might still have the set available. Alternate description with plenty of climbing accessories for bikers and hikers Dimensions: 45 x 40 x 28.5 cm (LxDxH).